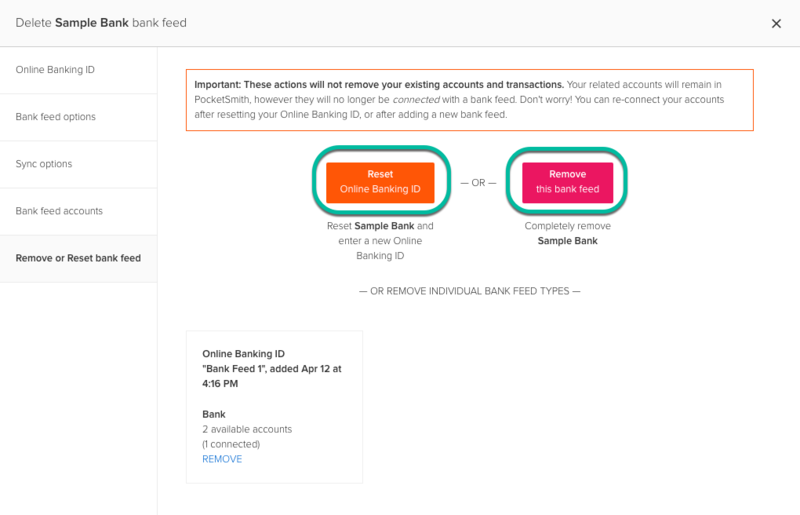 Learn how to reset or remove a bank feed from your PocketSmith account. Resetting or removing a bank feed will delete the credentials stored with our bank feed provider, Yodlee. This won't delete any accounts or transactions within PocketSmith but will stop any future imports from this bank feed. This will remove the bank feed from all connected accounts within PocketSmith and remove the credentials but will allow you to easily re-enter the credentials to re-connect the same bank feed. If you're not sure which option is right for you, contact support and we can guide you.